And then, snap, we’re back to winter. I wore four (!) layers this morning when I left for a day of errands. The extra sweater I threw on at the last minute was a wise move, because even with all those clothes, the wind cut bitterly against my skin in any spots that I’d left exposed. I took the subway down to Greenwich Village and walked purposefully past the pretty, stately brownstones that line lower Fifth Avenue and Washington Square Park. Every cafe and little boutique on my route beckoned invitingly, looking cozy and toasty. But I kept my head down and walked faster, stopping only once I’d reached the corner of West 3rd and Lafayette. I ducked into the foyer of the busy restaurant, bustling with the downtown brunch crowds, and elbowed my way to the hostess stand, untwining my scarf as I went. I pulled out my dogeared novel (I’m reading this) and ordered without glancing at the menu. A few pages later, the bartender cleared space and set down an oversized ceramic bowl of steaming chicken soup. The restaurant, ATLA, is known for contemporary Mexican food and this soup is really one of the very best if you’re feeling a little under the weather. The broth is rich and clear and brimming with small squares of carrot and zucchini. There are generous pieces of pulled chicken which hide an entire layer of rice and chickpeas. Thin slices of jalapeño and cilantro leaves dot the surface, giving a sinus-clearing heat to every spoonful. The piece de resistance? Half a sliced avocado sits on top, softening as you eat. The soup comes with a little woven basket of warm, just-pressed corn tortillas. I always order a side of crispy mushrooms. After finishing the bowl and briefly contemplating the wisdom of just throwing caution to the wind and ordering a 2 PM margarita (theirs is laced with lime curd! ), I instead pay the check and brave the elements again. These biscuits are, in a word, perfect. With a generous topping of everything bagel spice, they are flavorful enough to eat alone with no adornment. I get my everything bagel spice blend here, but I’m pretty sure most stores, including Trader Joe’s, sell a version these days. But if you want to make a real meal of it, here’s what I recommend: Split the biscuits in half horizontally. Mash a few slices of avocado and spread that on one half and drizzle a little hot sauce over the avocado. Fry an egg in a lot of olive oil, then drape a thin slice of sharp cheddar cheese over the egg. Slide the cheesy egg onto the other half of the biscuit, sandwich it all together, and pat yourself on the back for making a truly excellent breakfast sandwich. Cut the butter into the dry ingredients using a fork or pastry cutter until it's in mostly pea-sized chunks—some chunks can be slightly larger and some smaller, but don't overwork it. Add the milk to the dry ingredients—start with 3/4 cup of milk: you may find you only need that much, but you might need up to 1 1/4 cups, so add a bit more as you go if need be. Stir the dough with a fork until it is somewhat evenly moistened, then knead it a few times in the bowl so it mostly comes together in a ball but don't overwork it at all. It should not be cohesive and there should be chunks of drier areas and some wetter areas. 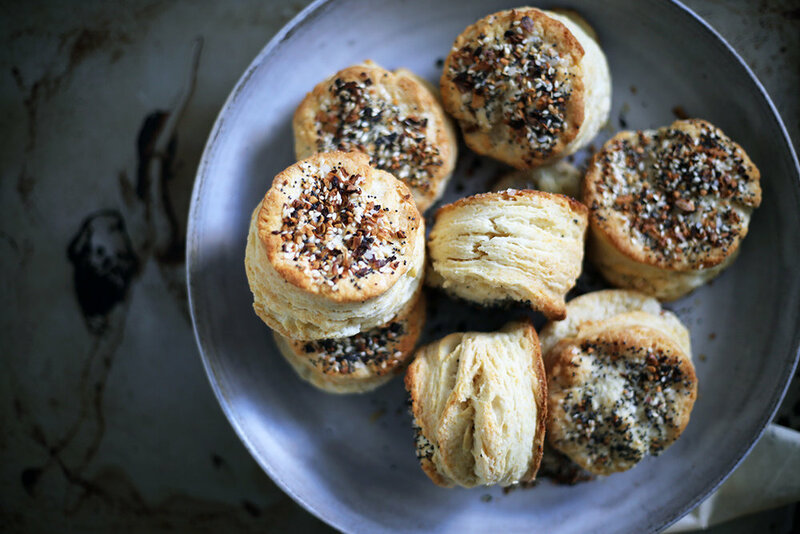 Brush the tops of the biscuits lightly with melted butter (or milk or beaten egg will work, too) and sprinkle the everything bagel spice blend generously over the tops.